Does not contain aspartame or saccharin. In this winner of weight, you will not find dextrose, but a formula optimized for fast and slow carbohydrates, which will lead to better results and performance. It is made with fructose (the best of fast carbs), Avena Sativa (one of the best suppliers in calories, “ie power) maltodextrin” low speed “(low carbohydrate very effective, not to make fat) and oligosaccharides (to improve bifidus absorption and effect on your body). Here are many products containing whey protein, but which contain the best protein isolated, there is only one, which is Promass. 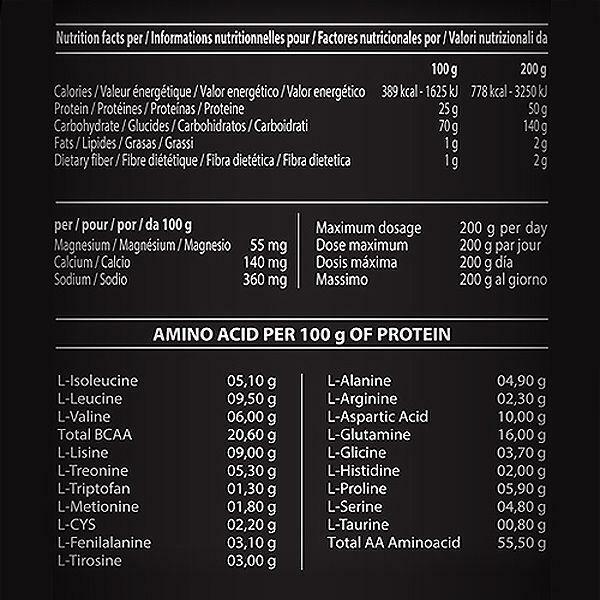 Their protein source is ISO 100 Zero, probably the best in quality protein and absorption takes place. All the lactose is removed, so Promass gainer is easily digested and assimilated, with Promass forget about the typical heavy stomach that give you other winners standard. We are sure that is the best source of calories and protein available. n addition to the above, Promass dissolve easily and taste incredibly delicious. Promass and your effort to attain the goal marked. Fructose, avena, maltodextrine, oligosacharide, milk protein isolate (CFM), unfatened cocoa*, identical natural flavors, gluoconate (magnesium, potasium, zinc, calcium), sucralose, natural pigments. *Only in chocolate flavor. Mix 5 measures (100 g) in 300 cc of water or skim milk. Food supplements should not be used to substitute a balanced diet. Store in a cool and dry place. Keep out of reach of children.